Over the past nine months, I have treated myself to not one, not two, but three solo writing retreats. Picture this: a gorgeous hotel room (with a fireplace), one takeout order from the Italian restaurant down the road, followed by a single scoop of mint chocolate chip ice cream from the candy shop next door, a giant king bed, and hours upon hours of dedicated work time before popping a sleeping pill and falling into an 8-hour coma. It is just as magical, wonderful, and amazing as one would think. I always pack too much, anticipating that 18 hours will magically feel like 58 hours because when you are alone, time is supposed to multiply, right? Only I am finding the opposite to be true, actually, because when I am alone for 18 hours, it somehow only feels like 7 hours. Half the items on my list remain unfinished, my face mask doesn't even make it out of the weekender bag, and the bottle of nail polish I’ve tucked into my purse mocks me the next morning as my hand grazes against it while I search for the car keys. I tell my husband and kids I miss them upon my return, which is true (of course), but how can that sentiment be true when this is also true: it did not feel like enough. It was enough in that I made a dent in the work. Between the three trips, I finished the book proposal, the sample introduction, the outline, the sales video script, a few essays, a blog post, some editing work. But when you are working against a deficit of what feels like hundreds of hours, it's easy to let discontentment creep in on the drive home. I needed more. That wasn't enough. The most amazing part of those writing retreats was not the eight hours of consecutive sleep (thank you, zzzquil), or the fancy robe in the closet (although I do love a good hotel robe), or even the warm lemon scones that were delivered to my hotel door at 7am each morning (hello, little luxury). The truth is, those perks paled in comparison to the real gold of the writing retreat: uninterrupted silence. Alone in that hotel room, my mind finally had space to think, to process, to pray, to reflect, to dream, to just…..be. For the past year, I have succumbed to the pressure of More, More, More in my work. I have said yes to things I shouldn’t have said yes to, and I have committed to things I shouldn’t have committed to. I have jumped in, headfirst, to every growth opportunity that came my way. I thought I could handle the stress, the fast pace. I’m strong and independent and capable so why shouldn’t I simultaneously run a website and work on a book and co-lead a writing workshop and photograph some families and co-host a podcast and wouldn’t it be amazing if we also created an app? For me, the problem has never been a shortage of ideas or opportunities; the problem has always been time and space to put my best foot forward in those ventures. From the outside looking in, people assume I have it all together. They say things like, "you inspire me!" and "I don't know how you are doing all of that!" My marriage has been ignored. My kids have endured the wrath of my constant impatience. I have forgotten how to write. I feel uninspired, unimaginative, unoriginal, and exhausted. I barely exercise. I eat too much cereal. I’m not praying often. And don't even get me started on sleep. My to-do list has taken over my life. I've become a slave to productivity, held hostage by my own inbox. I can no longer focus on one thing---there are always eleven tabs and six windows open on my computer screen. I bounce around from task to task, too antsy and restless to finish any one project. My mind never stops moving, never stops working, never stops thinking. I lie awake at 4am every night making lists in my head, beating myself up, thinking of all the ways I am failing, all of the people I'm disappointing, all of the things I should be doing better. A stressed out, overly-ambitious, overly-committed, hot mess. I purge our home so often that sometimes my husband doesn’t even bother bringing items into the house. “I know that’s going to end up at Goodwill,” he'll say, retrieving something from the car and tossing it into a paper bag that I keep in the garage for such occasions. Among my list of addictions, purging is right up there with sugar and caffeine. My idea of a fun Saturday is one where Brett takes the kids to the park while I get rid of 20% of our belongings with a podcast playing in the background. Introverting and liquidating: my personal recipe for a happy weekend. I have a deep affection for empty cabinets, space between the hangers, tables with nothing on them. I have mastered the art of the capsule wardrobe, and only keep around 40 items in my closet at all times. When the house is picked up, everything has a place (including the toys). I am practically ecstatic that my kids are now at the age where I can leave the house with nothing but a clutch. There's a single diaper and pack of wipes in the car for emergencies, and I no longer need to bring half a baby registry with me to the park. When there’s too much stuff in my house, my closet, the garage, etc, I immediately get overwhelmed. My motto with stuff has always been: less is more. Somehow I have become a walking contradiction: I am both a purger and a hoarder, tossing belongings out of my house without a second thought and collecting opportunities like seashells. My whole life is starting to feel like a too-stuffed closet. Like there’s no room in here, like I can’t breathe, like I can’t find anything I need. I can’t figure out what to wear because there are too many skirts and shoes and dresses and where did all these scarves come from? I don’t even wear scarves, but suddenly I’ve got six wrapped around my neck and is this what it feels like to suffocate? This is what happens, of course, when we add things to our closet time and time again without taking anything out. The hangers get closer and closer together, until everything smashes into an indistinguishable sea of fabrics and textures. Your favorite dress hangs in the back—shrunken behind an abundance of clothing—invisible. What good is it to have a beautiful dress hanging in your closet when you can't even see it? I don’t know how I got here. But I know I need to get out. And I know it’s going to be a lot of hard work, a lot of undoing. I lot of I’m sorry, I can’t do that’s and a lot of I wish I could, but now is not the right time’s. Disappointing people is never fun. But what good is it to create your dream job if you constantly feel suffocated by it? Most days, I feel like a total and complete imposter. I'm flying by the seat of my pants, making up my own rules and figuring it out as I go along. Did you know that I've never taken a writing class in my life? I've completed exactly one photography workshop. I've never taken a business class. I know nothing about paying self-employment taxes or bookkeeping or publishing a book. Every day I feel like an idiot at least once, googling how to do something else. How did people ever live without Google? I ask Google the small questions, and ponder the bigger ones at 2am while everyone else in my house sleeps. How do women start businesses and take care of their kids and not lose their minds? 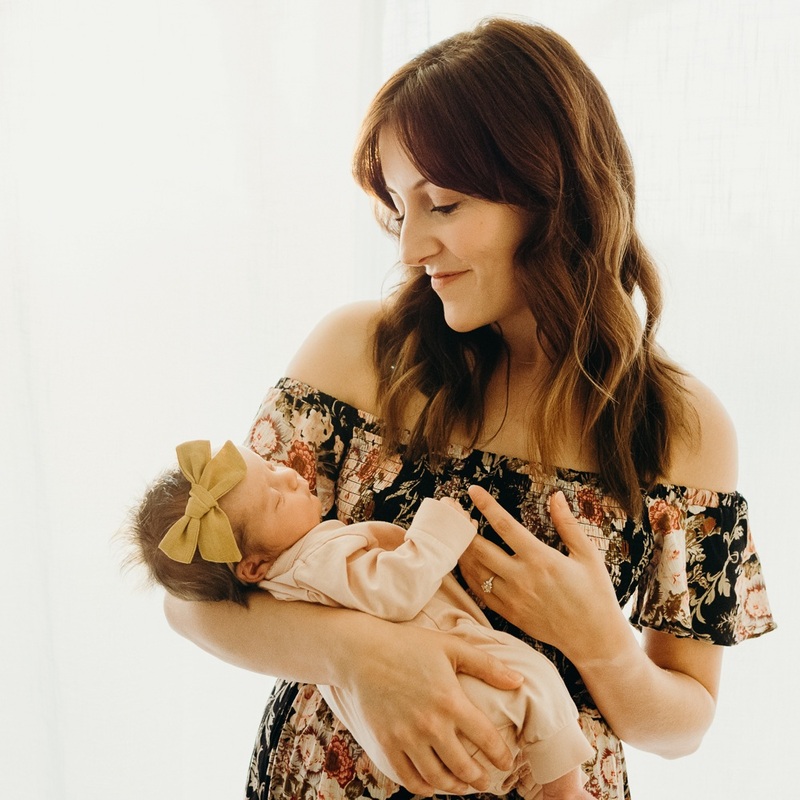 How do mothers balance pouring their hearts into their work while also pouring their hearts into their marriage, their children, their friendships? How do I keep running this business without letting it run me? I have no black and white answer, no aha moment, no pretty bow for the end of this. But I do feel better after saying it out loud. I am starting to seek refuge and freedom through small steps. Ten minutes in the backyard, journaling under the twinkle lights. Fifteen minutes reading a devotional in bed. Four minutes writing an e-mail undoing an unnecessary commitment. Seven minutes making a smoothie bowl with freshly sliced bananas on top. Twenty minutes talking to my husband on the couch, our legs entangled like a pretzel. Thirteen minutes playing toy trains on the floor with my kids while my phone stays in another room. Less is more, less is more. Somewhere along the line, I forgot how to do those things. I became a walking to-do list, a chart of accomplishments, a name on a book, an Instagram feed. When I looked in the mirror, all I saw was exhaustion, guilt, and the overwhelming feeling of not being enough. One of my best friends growing up was a guy named Kory. I spent a lot of time at his house when we were in high school, and every time we left to go grab dinner or see a movie, his dad would smile at us and say, "Remember who you are." Remember who you are. Remember who you are. Remember who you are. If you're looking in the mirror today struggling to see past the exhaustion and guilt and inadequacy of trying to do it all and be it all and have it all; if you're treading water and struggling to breathe, please know that I am right beside you. Let's remember who we are. We are daughters of the King. And that will always and forever be enough.